This landscape format book is the second in a series on Norfolk wildlife by the same author. It deals with the Norfolk coast and combines photographs of wildlife (mostly birds) and poems, with a short accompanying text. The ‘worshipful companies’ bit is his comparison of the different bird species with medieval guilds (or trades). I found the analogy a little stretched at times but these things are highly personal and others will no doubt make the connections more readily. Redshank are the town cryers, which makes sense. Curlews are ‘fletchers and bowyers’ because of the ‘dart-flight’ markings on the belly and the long, curved beak. And Shovelers are the apothecaries, because the varied plumage of the males is reminiscent of various coloured potions and bottles, cluttered together on the shelf. I enjoyed the poems, though it sometimes took me two or three readings to pick up on his lines of thought. The text is, in part, explanatory – describing the origins behind the poems and their meaning, and tying the poetry and the photography together. As he explains, revisiting the photographs often helps him connect more fully to his experience in the field and inspires some of his poetry. This is a lovely book to flick through. It is well presented and it scores highly on originality, as a very personal set of ideas and thoughts. It will, I think, best suit the more reflective types who are interested in how others see birds and the connections they can inspire in our minds. If you simply want a book about birds in Norfolk, describing their behaviour and where you might expect to find them, this may not be for you. But if you have a log fire, a spare winter evening and half a bottle of red wine, this is perhaps the perfect complement. 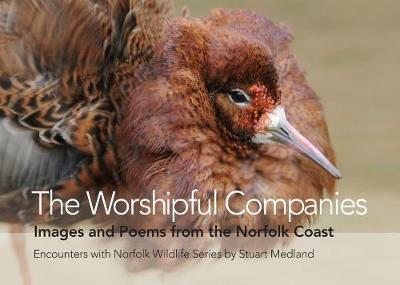 The Worshipful Companies: images and poems from the Norfolk coast by Stuart Medland is published by Brambleby Books.